This article will cover the issues regarding cross-domain calls. what is JSONP? What is the use of JSONP? What is CORS? Same Origin Policy, also called Single Origin Policy, is a security measure which restricts a web page to make AJAX requests only within the same domain. Browser security prevents a web page from making AJAX requests to another domain. Let’s see this with an example. Create two projects (Server and Client) in Visual Studio. The project named “Server”: We will use Web API as a Server/Service in this project. Add a controller (e.g. StudentController) in the Web API by right-clicking on the Controller folder. Select add -> controller from the menu list. Name the controller “StudentController” and select the Empty template. Right click on the Models folder and select add -> class from the menu list. Name the class file as Student.cs. Copy the below code to the class file named “Student.cs”. Id = 1, FirstName = "Raj", LastName = "Kumar", Gender = "Male"
Id = 2, FirstName = "Karan", LastName = "Sharma", Gender = "Male"
Id = 3, FirstName = "Neha", LastName = "Sharma", Gender = "Female"
Id = 4, FirstName = "Maninder", LastName = "Singh", Gender = "Male"
I have created a Student.cs class to get the dummy data from the Student class. Instead of creating a Student class you can use Entity Framework with SQL Server to fetch the data. Once you are done with the above code, your Web API service is ready to use. Let's make a call to the Web API to check if everything is working as expected. Browse the service in the web browser and append the following lines in the URL to hit our StudentController. The above URL can vary according to the port number. In my case, my port number is 60545. After filling the above URL in the browser, press enter or go button in the browser. You will get the below XML in the browser. So, our Web API Service is up and running as expected. Now, it's time to create a client project which can call/consume this web service. We are using Web Form, you can create one simple HTML page as well. The below example explains Web Form Project as a client. Under the Template pane, select Web Forms and click Ok. Right click on the Project and Add New HTML page. Name that page as Students.html. Open the Students.html page. Delete the existing code and paste the below code in the HTML file. In the client code, we have imported jQuery file. Under the AJAX call, we are calling our Web API service. That's it -- we are done with both the Client and Service code. It's time to test our functionality. The above error describes that for the security reason browsers does not allow cross-domain AJAX requests. How to fix this issue? There are two ways to get around this problem. JSONP stands for JSON with Padding. It's a process used for sending the data cross domain without the use of XMLHttpRequest object. JSONP wraps the data/result in a function. The above command will install dependant jsonp files according to the framework. Open the WebApiConfig.cs file and update the code with below code. Build the project and re-run the scenario. 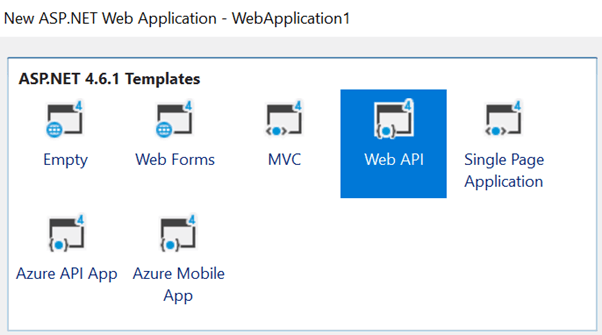 What is CORS in Web API? CORS is a W3C standard that allows you to bypass the same origin policy adopted by the browsers which restrict access from one domain of resources belonging to another domain. CORS works on the principle of same origin policy. Let's remove our previous JSONP references from our existing project so we can achieve the functionality using CORS. 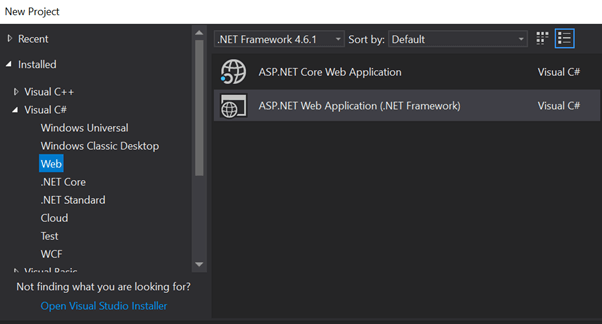 Install the following package on the Web API Server Project using Package Manager Console window. Add the following code in the WebApiConfig.cs. Provide the list of URLs of clients who want to access this Web API. The headers parameter of the [EnableCors] attribute specifies which author request headers are allowed. The above setting will get applied on Global Level. It can be applied on Controller level as well. Build the Solution and re-run the scenario.